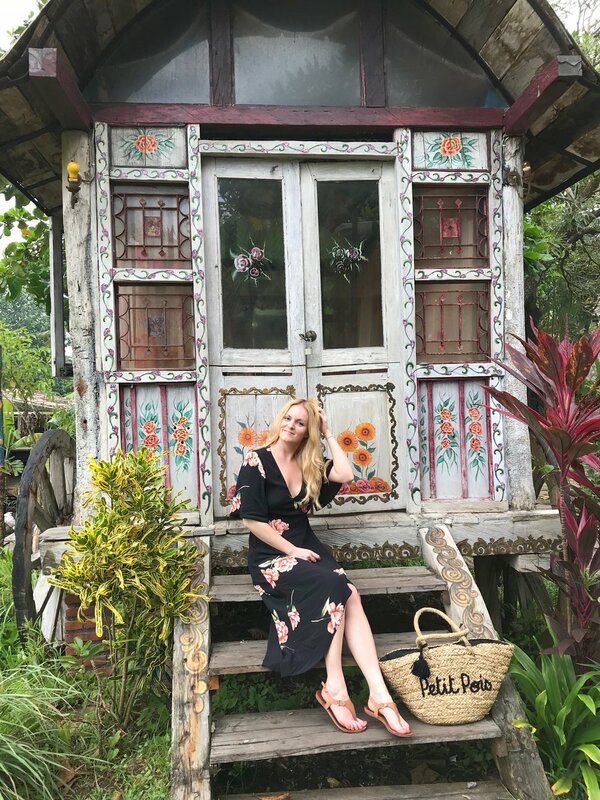 If like me, you’re a lover of all things bohemian, then la Laguna in Berawa, Bali, is the perfect spot to watch the sun go down. Opened in 2014, La Laguna is a beach bar, restaurant and all round cool vibes kinda place, created by Gonzalo and Sandra Assieg. They wanted to build something special at La Laguna, a place where visitors would be transported to a magical world, and it does exactly that. La Laguna is situated in Berawa Beach, in Canggu, but it’s easily accessible by car or bike from Seminyak or Kuta. (We were staying just up the road at a resort in Berawa, so we just drove our bike down for the evening). I reserved us a table beforehand, (as with a lot of Bali’s popular beach clubs, they can get very busy, particularly just before sunset) so I wanted to make sure we had a table. 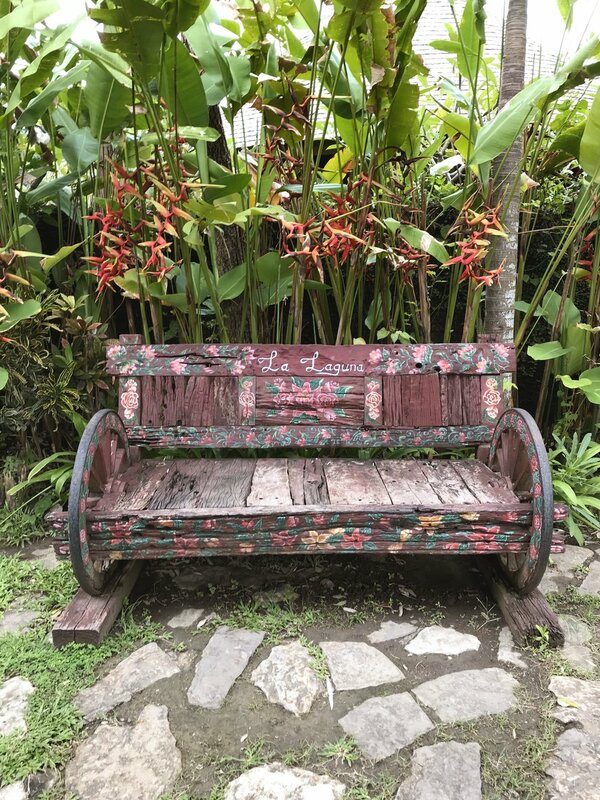 On arrival, you’re instantly greeted by luscious tropical plants and trees, and an element of the unexpected, as you go along towards the entrance way. 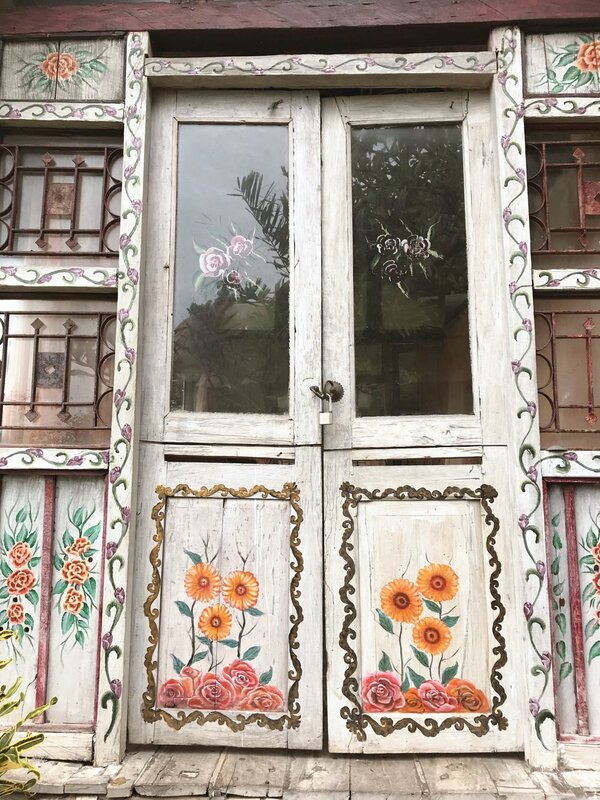 Once you start following the path along, you're met with the most magical array of vintage gypsy caravans. During our visit it was still daylight at this point, (but the sun was hanging low, so it was pretty special, and we got to see the colourful caravans in all their gorgeous glory. 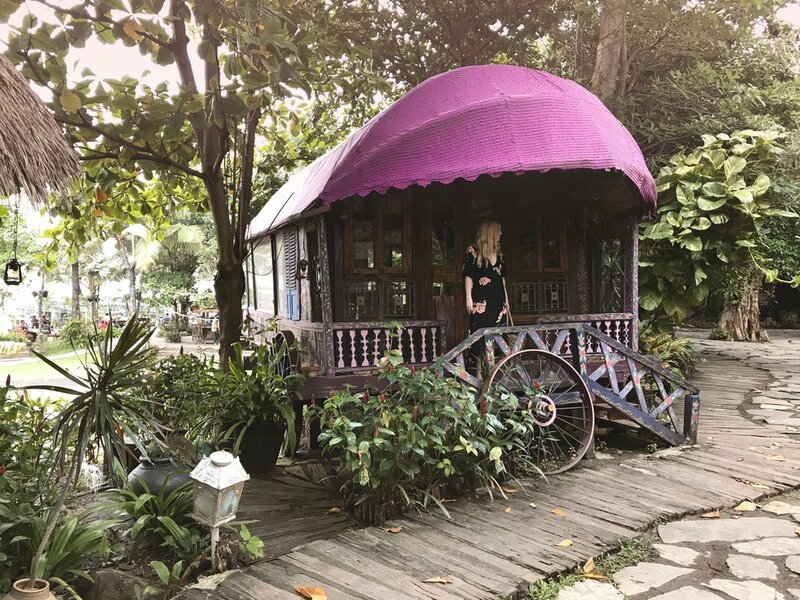 As we walked further along the path, there was music playing in the background and we even found a caravan where you could have your fortune told and tarot cards read. Everything felt very authentic. Like going back in time, or at least like a movie set (I couldn't help but think of the Pirates Of The Caribbean for some reason) and was half expecting Captain Jack and his motley crew to appear, but there was no pirate ship, just a lot of gorgeous gardens and the promise of a sea view coming round the corner. We stayed for a while, taking in the paintings and took some snaps, before wandering down towards the restaurant and beach area. A little further along, once we reached the restaurant, we were greeted by a view of Berawa beach and the last of the day's sun hung low. There was a bridge taking you out to sea, and a beautiful bohemian garden area with brightly coloured cushions and festoon lights, and a few other visitors taking in the atmosphere. We were met by a lovely member of the La Laguna team, and taken to our table just on the outside of the restaurant. (We had a beautiful spot to watch the sun go down) and the table even had a pretty table setting, that perfectly complimented the rest of our surroundings, with vintage embroidered placemats and rustic flower arrangements. (The waitresses had the prettiest rose print dresses too, so look out for these). We ordered a selection of food (the menu is mostly Spanish/Mediterranean dishes, sharing plates, and cocktails). We went for a main course each (Chicken and salmon) which came with two big sides per course. (There was a lot of food for just the two of us!!) But I still managed to fit in a chocolate dessert). A little bit more expensive than your average mid range restaurant in Bali, but the food was delicious and we didn't mind considering how gorgeous the grounds and surroundings were. Once the sun had gone down, we went for a wander round the gardens a bit more, and it looked even more spectacular all lit up, with the caravans and beach glowing as a backdrop. There was also a little fire pit in one of the garden areas, and people were arriving for cocktails at the a separate wooden bar area. La Laguna was one of those places that was busy, but you never really noticed, as you just got lost in the atmosphere and surroundings. We don't have anything like this at home in the UK, so it was a welcome experience. So unexpected and different from all the other beach clubs and bars, that we’d previously visited in Bali. 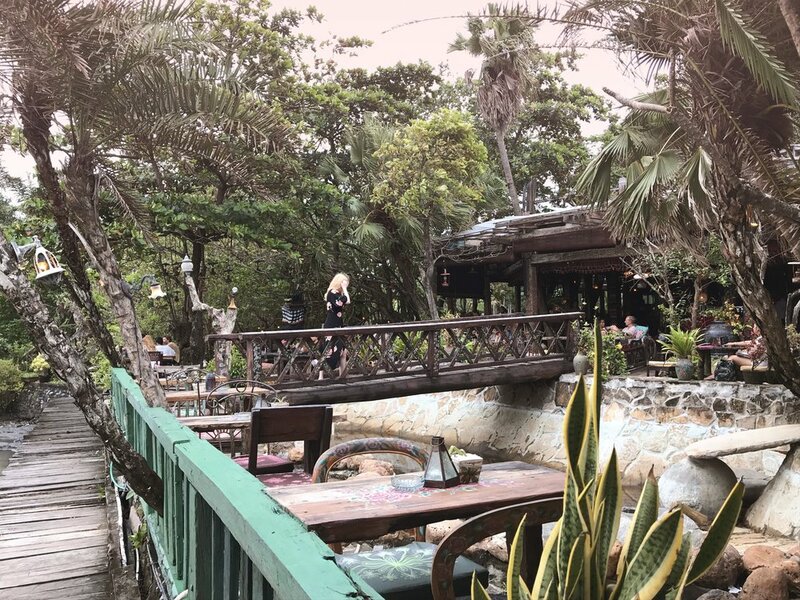 If you make a trip to any of the beach clubs when you’re visiting Bali, and you want something with a bit of a twist, then be sure to head to La Laguna. I'd love to know if you make it there.